Okay, so it's not an iPhone killer--more of an iPhone mini. 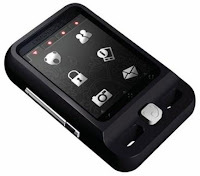 Neonode, a Swedish mobile brand will enter the US market in 2008 with its brand new phone, the Neonode N2. The Neonode N2 is said to have the same interface as the "iPhone". Though the Neonode N2 has already been released in the European market, the company hasn't caused so much as a ripple in the news. I don't know if the Neonode N2 will carry the same specifications it has when it was released in Europe but the Neonode N2 has a 2 inch screen, a Quadband phone, 2 mega pixel camera, and only weighs 70 grams. There's still no news as to which wireless carrier will carry the Neonode N2 but it will be announced together with pricing on the second quarter of 2008.